Accelerate breakdown of unpleasant odours associated with handling oily wastes. 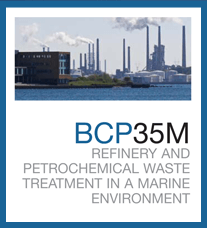 BCP35M contains aerobic and facultative anaerobic microorganisms to provide greater resistance to the effects of organic inhibitors present in wastewaters with a high salt content. BCP35M contains Rhamnolipids that greatly increase the biological decomposition of the hydrocarbon by separating the contaminant into smaller droplets. This allows for improved bioavailability for our proprietary bacteria, which have been specifically developed to digest hydrocarbons aggressively. Rhamnolipids are also known to support naturally occurring in situ bacteria digestion and degradation. *Spread this initial dosage out over the course of 10 days. ** Add as regularly as possible. If one day is missed, double the daily dosage the next day. Dosage rates will vary with flow rates, retention times and system variations. The rates above are for a typical, well-maintained system. Activated Sludge Systems — Activated Sludge Systems include various process flow sheets: e.g. extended aeration, contact stabilization, step aeration, oxygen activated sludge. The application rate for all products is based on the average daily flow rate to the aeration basin, excluding the return sludge stream. Trickling Filter and Rotating Biological Contactors — The application rate for all products is based on the average daily flow rate to the filter or contactor, excluding any recirculating process stream. • Aerated systems — application rate is based on the average flow rate to the lagoon. • Lagoons in cold climates — commence program when the water temperature is at least 110C (500F). The information presented in this Product Sheet is believed to be reliable. This information is provided as representative only and there are no warranties, expressed or implied,regarding its performance. Since neither distributor nor manufacturer has any control over handling, storage, use and application conditions, they are not responsible for any claims, liabilities, damages, costs or expenses of any kind arising out of or in any way connected with the handling, storage or use of the product described.